Yes, I’m still on spring hiatus, but the place was getting to look a bit run down. 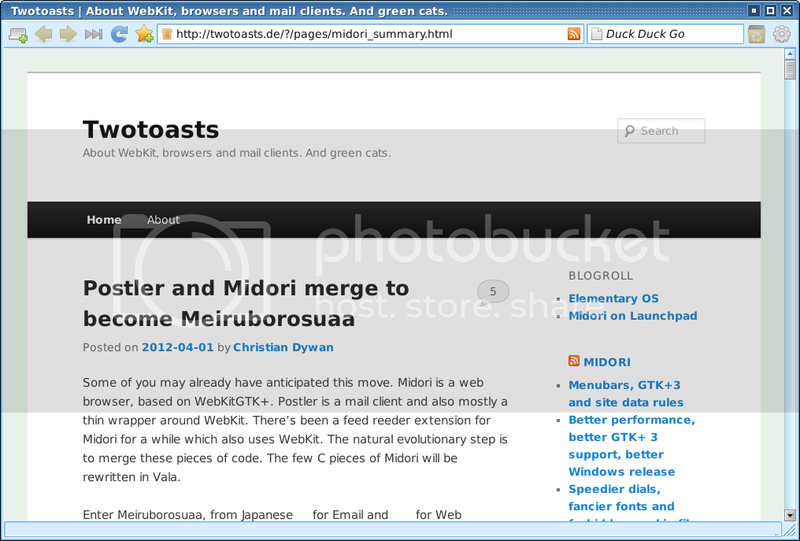 Plus, I wanted to show you all how to install this cool little browser that I found called Midori. Oh, it’s nothing new. It’s been around for a while, but it’s new to me. I first found it while using Salix OS recently on one of my tester partitions. I’m also using it in Zorin OS on one of my laptops. It’s fast. It’s pretty simplistic and minimal, too. It is a bit complicated to install on Slackware, though. However, I’m sure you can do it. It just requires using some excellent SlackBuild scripts provided by the dedicated folks at SlackBuilds.org. Unfortunately, Midori is not one of those apps that you can install with just one SlackBuild. It has some dependencies… and its dependencies have some dependencies. Fire up your current browser and navigate to SlackBuilds.org. You know the place. You’ve been there before. Once you’re there, you’re going to search and download six different SlackBuild scripts and their related source tar balls. Got that? OK.
Midori is your ultimate goal. It requires webkitgtk, libunique, and vala. 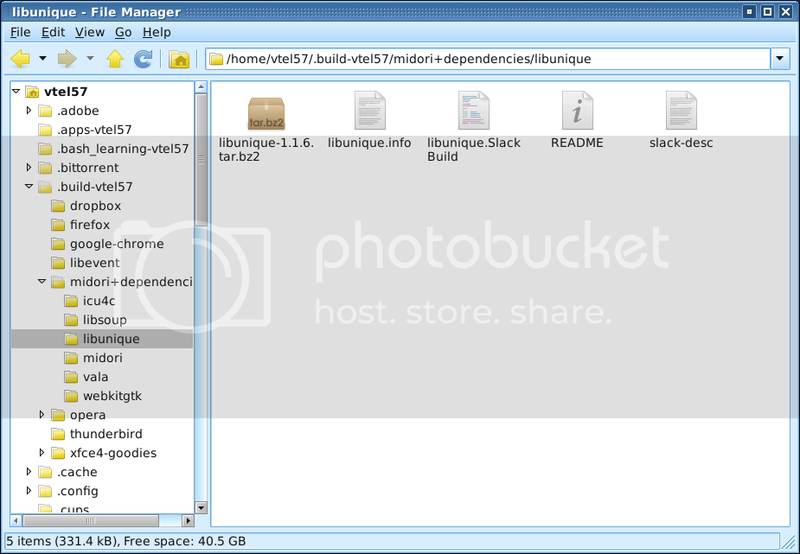 The others are dependencies of webkitgtk and will have to be built first and installed before you build webkitgtk. You should be familiar with the whole SlackBuild thing by now. Just in case, though, I’ll run through one for you. NOTE: You might also want to keep these packages somewhere safe in case you ever want to reinstall Midori on this system or another Slackware installation somewhere. Now, we need to build and install the rest of the dependencies in this order: icu4c, libsoup, vala. Once you’ve built and installed these guys, you can then build and install webkitgtk. Something to keep in mind once you begin your webkitgtk build; it is NOT one of those zippity-fast builds. Even on a fast system, it may take 45 minutes to build. Just be patient. Don’t sit there waiting for the pot to boil. Go have some dinner or take a healthy walk around the neighborhood while it builds. OK, assuming you’ve managed to build and install libunique, icu4c, libsoup, vala… and then webkitgtk, you should now be able to build and install midori. It’s a pretty fast build, less than 1/2 a minute. Install it using pkgtool, as you did with the others above. If all went well, you should have a nice working Midori browser on your system now. If you run Xfce4 like I do, it will automagically show up in the Menu –> Network sub-menu. and select ‘Queuefile’ when prompted. Thanks for the info. And for stopping by and reading/commenting. Very nice write up Eric!! I just installed MIdori on Archlinux and I am playing around with it now. Couldn’t stay away, he? I’ve been using sbopkg since last year, makes it all a lot easier, but I hadn’t heard of queue files either.